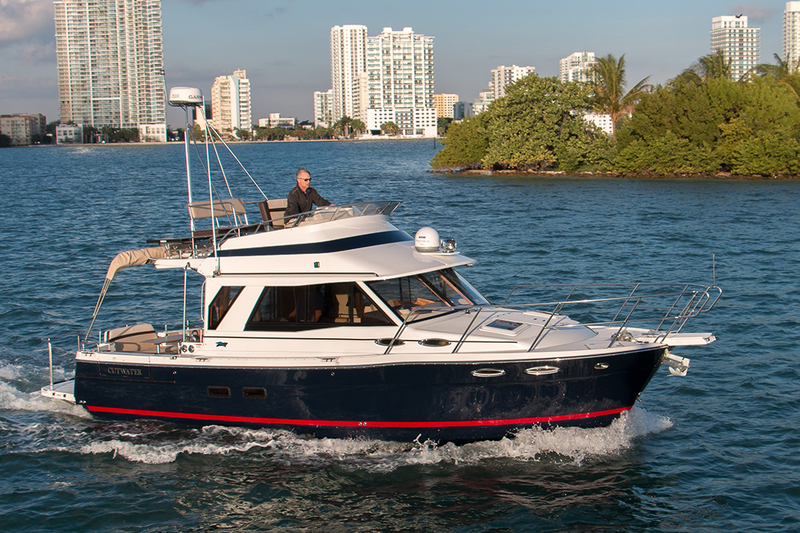 For some cruising yacht buyers, bigger and faster will always be on their wish list. But a number of cruisers are now opting for high-quality construction, reliable fuel-efficient powerplants and well-designed interiors—in boats that are small enough to handle easily. A growing list of compact sedan-style cruisers on the market includes boats with trawler or tug-style design elements, with the comfort and stability of traditional trawlers but with hull designs and engines that also deliver planing or semi-planing speeds on demand. Some cruisers still choose small true displacement-speed trawlers, but many more want to have more speed available to shorten long passages or to get out of the way of nasty weather. The small cruisers gaining popularity quickly these days are about 30 feet or under. Many have a beam of 8’6”, making them easily trailerable without special permits. 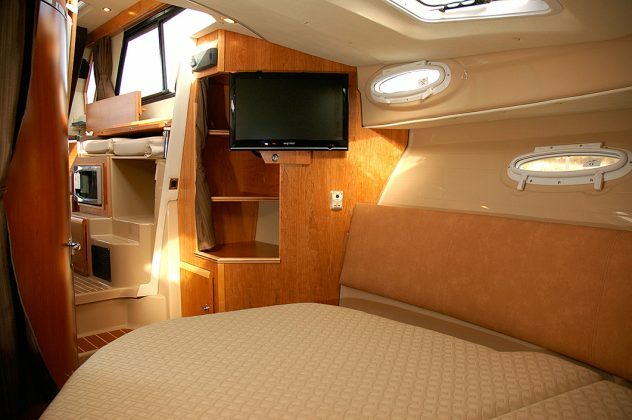 That convenience offers cruisers the option of relocating quickly to new cruising grounds. 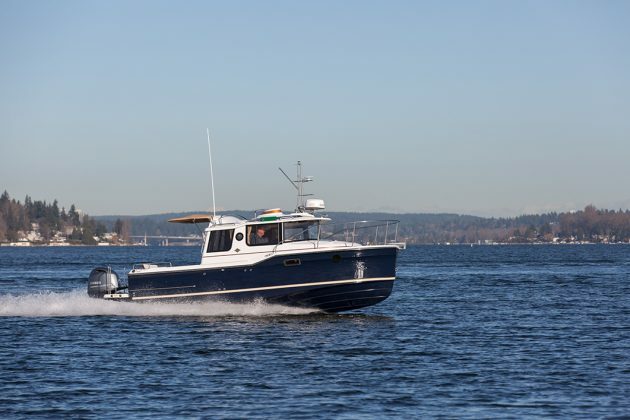 The main design influences on this new crop of cruisers are the cruising tugs of the Pacific Northwest and lobster-style boats of the Atlantic Northeast. On top of the list are trailerable Cutwater and Ranger Tug boats, both built by Fluid Motion, LLC, in Kent, Washington. Ranger Tugs has a current lineup from 21 to 31 feet, while the enclosed coupe-style Cutwaters are from 24 to 30 feet in length. 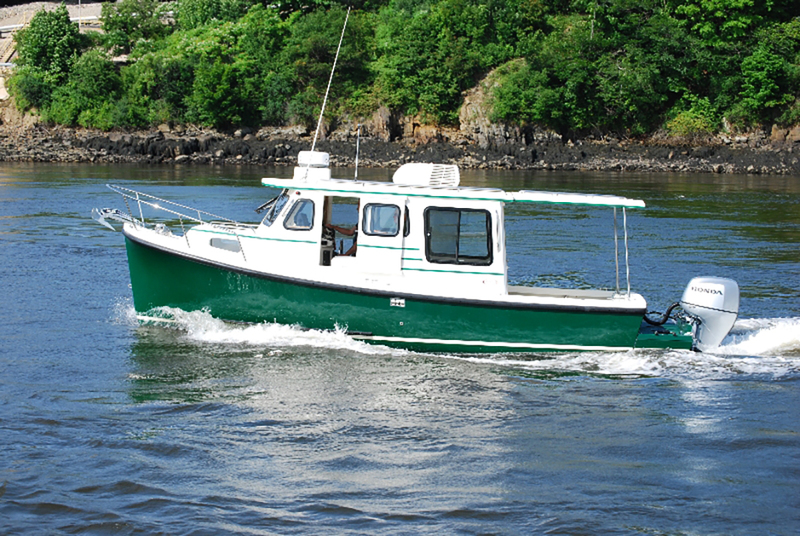 Arguably, the Rosborough RF-246—designed in Nova Scotia in 1987 and built there until 2012—was the original speedy “pocket trawler” and still has a large following across Canada and the U.S. At 25 feet, with an 8’6” beam and outboard or sterndrive power, it is easily trailerable. Since 2012, it’s been built by Eastern Boats in Milton, New Hampshire. The Camano 31, designed and built in B.C. 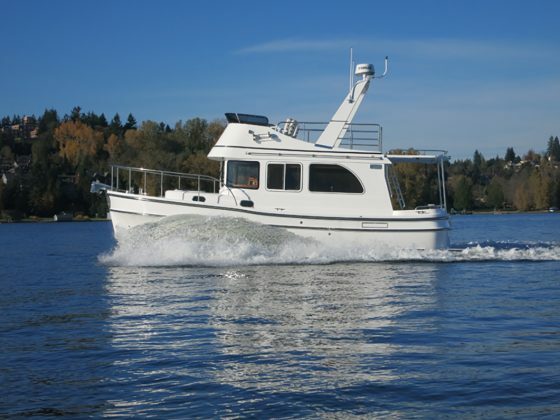 for many years, is another small “fast trawler” with Canadian roots. Construction of Camanos halted in B.C. 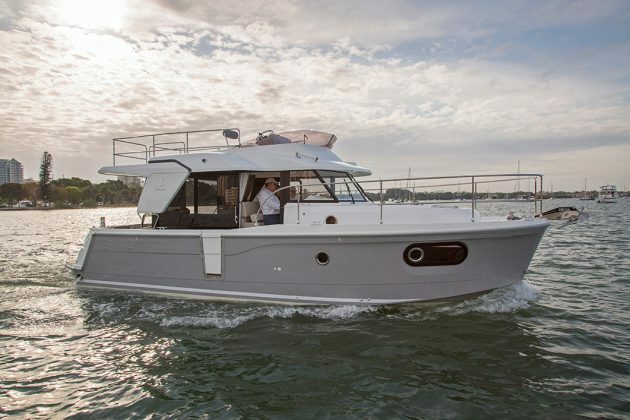 a few years ago, but a 30-footer, with a 10-foot, 6-inch beam, is now being built and sold as the Helmsman 31 Sedan, as part of a four-model line of Helmsman Yachts, based in Seattle, Washington. Like the Helmsman 31, the Beneteau Swift Trawler 30—with an overall length of 32 feet 9 inches and a beam of 11 feet 7 inches—is not a trailer-boat. But with a spacious, well-laid-out interior, 370-hp engine and easy-access features like a starboard-side door in the topsides, it is sure to have wide appeal for small-boat cruisers. Built in France, the Swift Cruiser line ranges up to 50 feet. 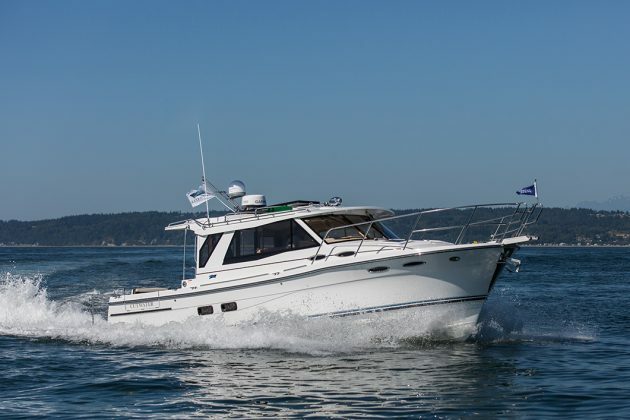 At Maple City Marine in Chatham, Ont., a Beneteau dealer, Grant Rule says cruisers buying the Swift Trawler 30 also include reformed sailors and downsizing powerboaters. While giving up size and speed, the buyers are opting for fuel economy, ease of operation and practicality. “It’s got to be a liveable boat with lots of room to move around,” he says. Ryan Stovold of Lefroy Harbour Resorts, Ranger Tug dealer for eastern Canada, says cruisers buying the boats include some cruising families and couples, but the majority are experienced, downsizing powerboaters and former sailors. 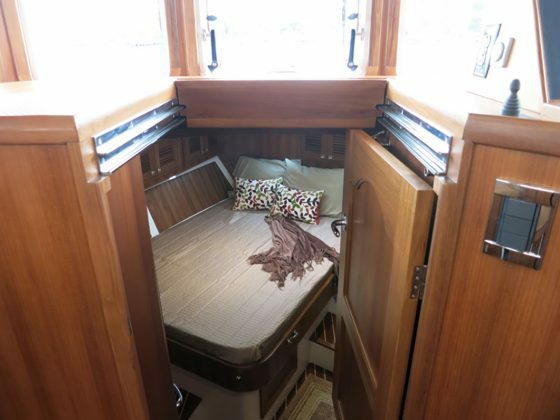 Many, he says, take advantage of the boats’ easy trailerability and adopt a “boaterhome” approach to cruising—readily trailering their boats to cruising grounds around North America. Ranger Tug owners and informal ambassadors for the brand, Jim and Lisa Favors help show people how to get the most of a trailerable small cruiser on their Trailer Trawler Life website and blog. Stovold and some of his clients took part in a Ranger Tugs rendezvous held two years ago in Little Current, Ont., and the North Channel, organized by the Favors. Stovold says participants came from as far away as Texas. Cutwater’s 30-footers and Ranger Tugs’ 29- and 31-foot models all have 10-foot beams. With those boats, towing is still possible but requires a special permit for the extra width and a highly capable heavy-duty tow vehicle. While compact cruisers combine predictable handling, stability and speed, they come with a variety of hull shapes and designs. The Rosborough RF-246 has a classic lobster-boat hull, with an almost plumb bow with sharp entry forward, full bow sections and almost flat sections aft. Depending on power, the boat is capable of speeds up to about 30 mph, cruising nicely at 20 mph. Cutwater uses the more complex, but equally effective Keel Stepped Hull, with a nearly vertical forefoot, full forward sections (that also create a spacious forecabin), tapered intake tunnels and steps, plus a keel pad and a skeg keel along the aft third of the bottom. The skeg keel improves tracking but also serves to protect the boat’s running gear. 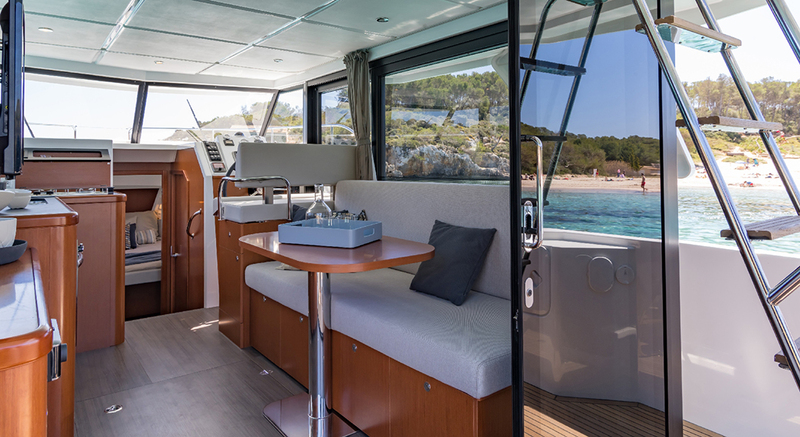 Beneteau’s Swift Trawler 30 also uses a skeg keel to provide contribute stability as well as protect the prop and running gear, with sharper sections forward for comfort and handling, but flatter hull sections aft for speed. Most of the Ranger Tugs have semi-displacement hulls with hard chines and keels for prop protection and stability. 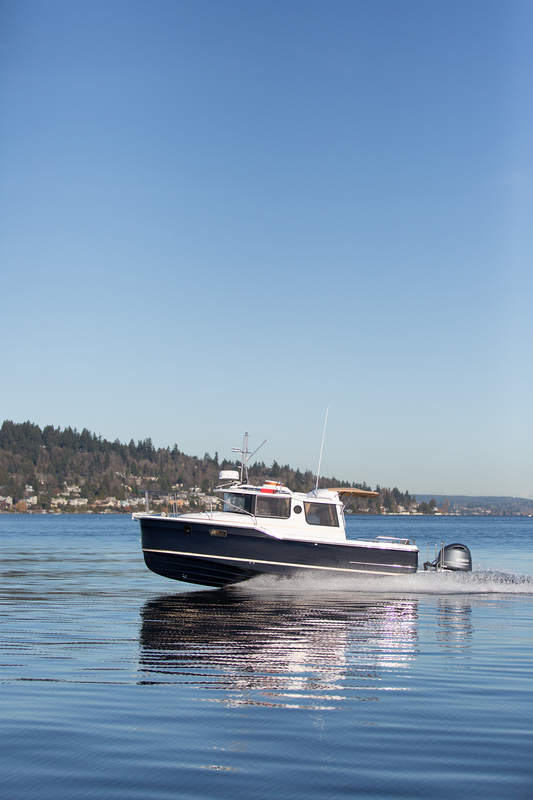 The new Ranger R-23 has a full planing hull, equipped with a Laminar Flow Interrupter hull designed and patented by Ranger Tugs lead designer Dave Livingston. 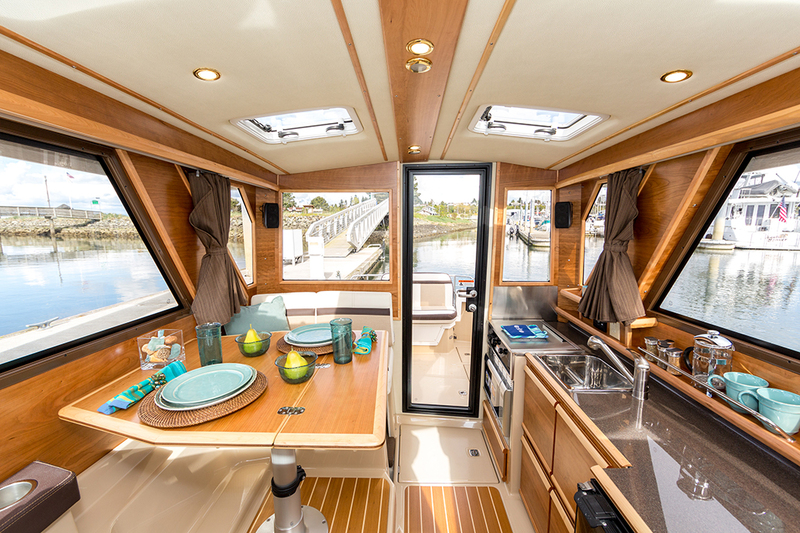 The Helmsman 31 has made several interior and layout improvements to the original Camano design, but sticks with the unique Keelform hull design by Vancouver-based designer Bob Warman. 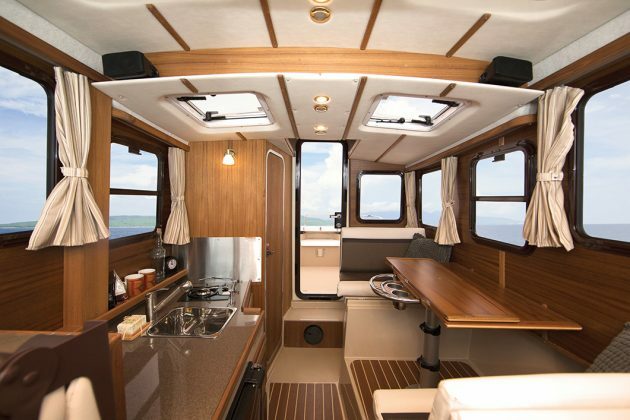 The Helmsman 31’s keel contributes displacement and planing elements and adds buoyancy. On the water, the elements combine to allow semi-displacement speeds approaching 20 mph. 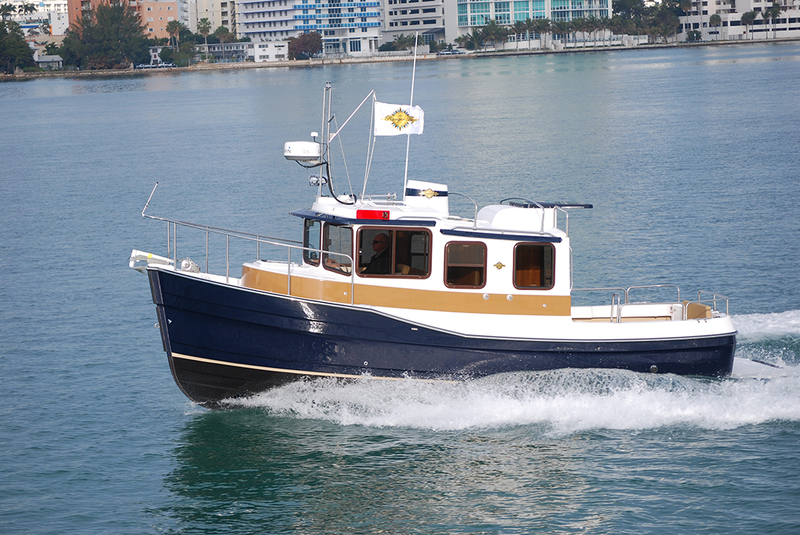 Traditional trawlers meant to operate at displacement speeds mainly rely on inboard diesels. Today’s higher-revving diesels mean cruisers can take advantage of diesel engines’ fuel efficiency and high speed capabilities. But fuel-efficient four-stroke or direct-injection two-stroke outboards also offer fuel efficiency along with space advantages. As Rosborough RF-246 models illustrated over the past three decades, outboards mounted on brackets can provide efficient propulsion while opening up additional cockpit space. 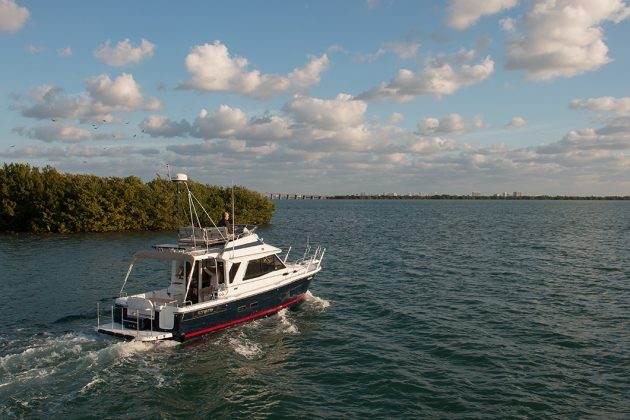 Cutwater already offers a single-engine 24-foot outboard model and a twin-engine outboard-powered 30-footer. The new Ranger R-23, powered by a single 200-hp Yamaha four-stroke outboard, also confirms the value of outboard power for small cruisers and may lead to expansion of outboard power for small production cruisers. 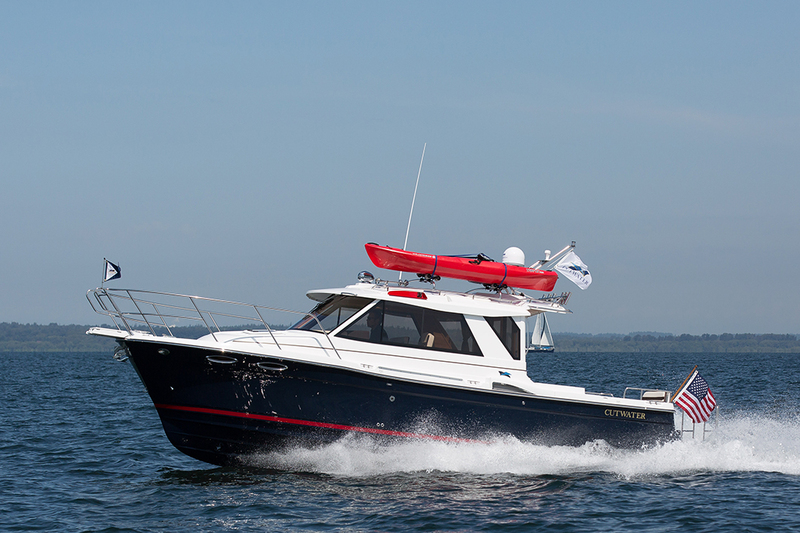 A new outboard-powered 27-foot Ranger is on the drawing board. 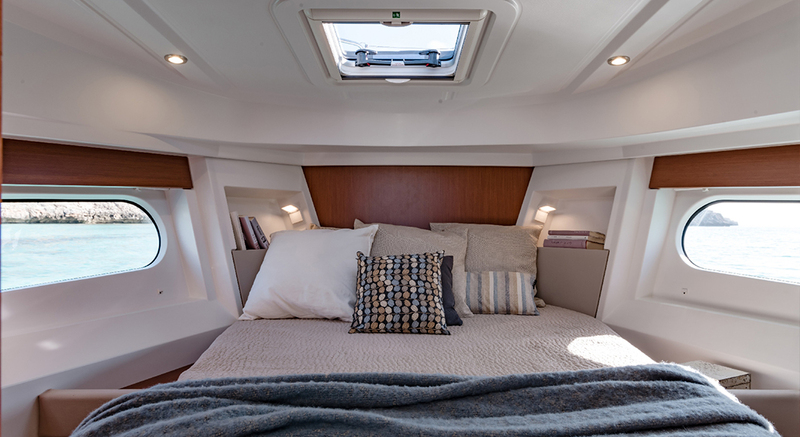 With little cabin and deck space to work with, the designers of today’s compact cruisers must carefully consider ergonomics and seek out unique design solutions to the space challenges. The Rosborough takes a traditional approach, with a V-berth and head forward, helm seat and a choice of a dinette or settee in the salon area. Large windows make the salon feel spacious and the cockpit hardtop adds usable space. 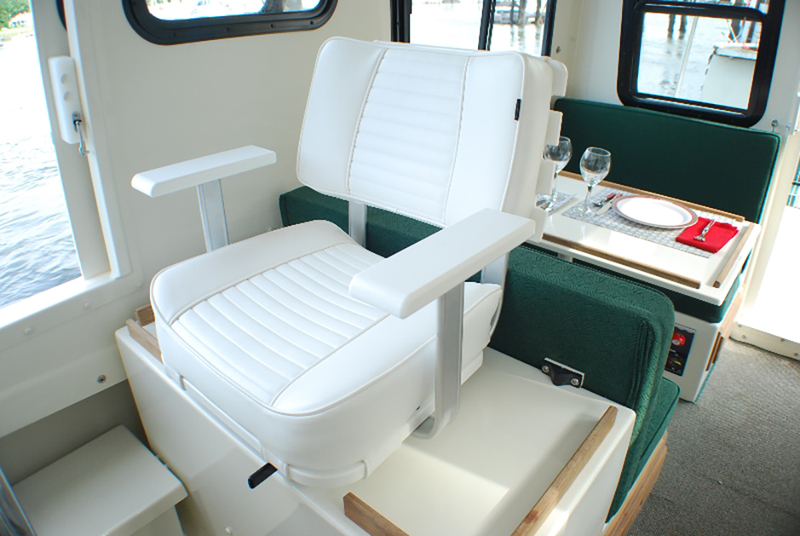 Both Cutwater and Ranger Tug yachts use innovative folding and tilting seats to expand seating options in salons and cockpits. Inside, helm seats flip and fold to do double duty for dinette seating. 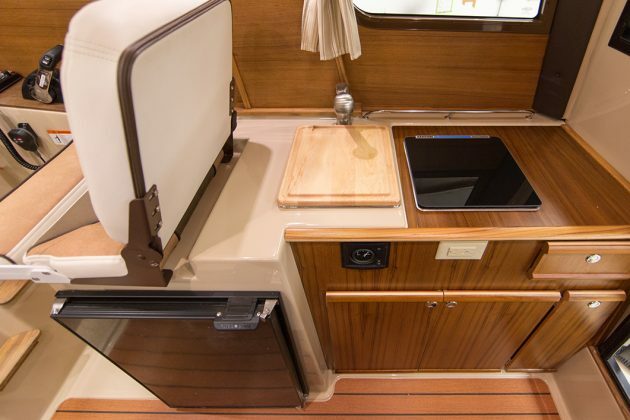 On the 24-foot Cutwater as well as the new Ranger R-23 and the R-29 models, a flipping double-wide dinette seat combines with a huge, hinged port-side bulkhead window to create an aft-facing open air seating area facing into the cockpit. Seats that fold outboard from the cockpit coamings (in the Ranger R-31 models, for example) and up from cockpit coamings (on some Cutwater and Ranger models, for example) expand usable space in the cockpits while eliminating any need for folding deck chairs. 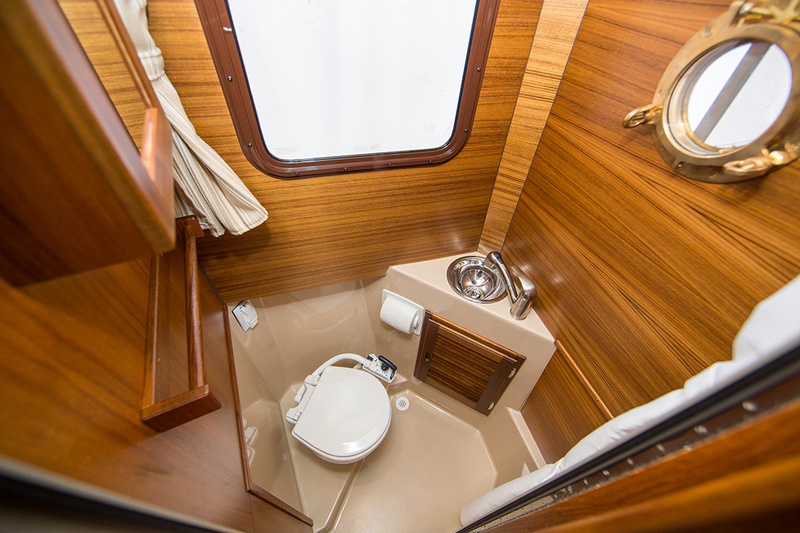 Cutwater and Ranger Tug cruisers maximize available salon space by locating a mid-cabin under the dinettes. 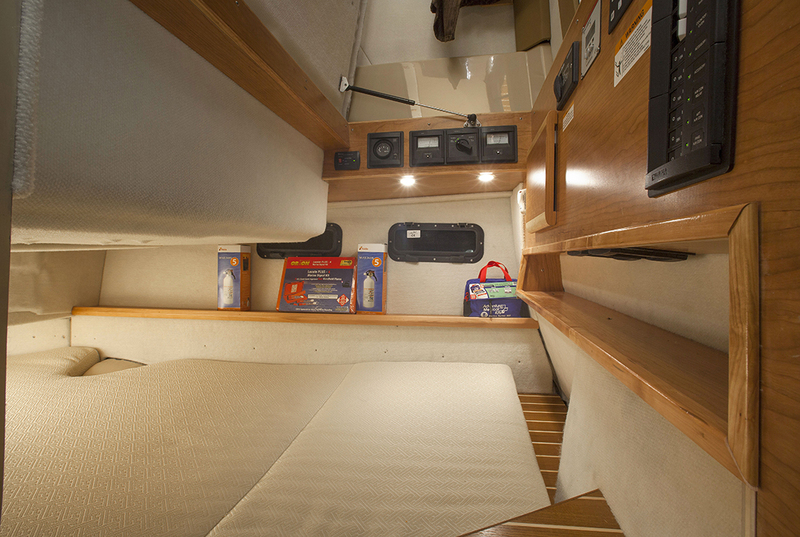 The cabins provide extra sleeping space when needed, or extra storage space. The Beneteau Swift Trawler 30 has two unique design elements that help it optimize outdoor and indoor space. At anchor or in the marina, the yacht’s transom opens up fully to incorporate the cockpit with the swim platform. A pair of jump seats also adds to usable cockpit space. 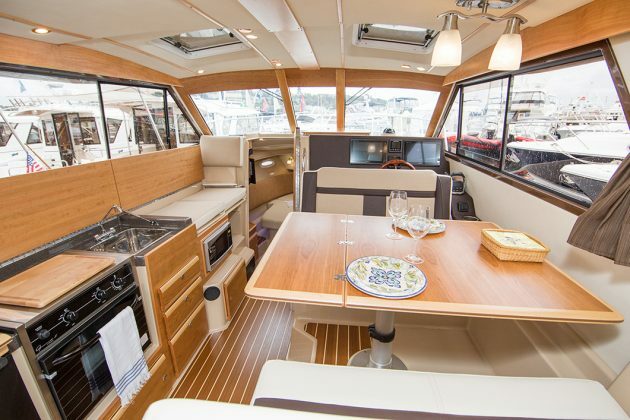 The Beneteau also has asymmetrical side decks to help make space in the salon without giving up safe passage to the foredeck. So there’s a wide, well-protected walkway forward to starboard and a narrower passage to port. Recognizing the need for easy and safe boarding for people of all ages and abilities, compact cruisers include boarding doors and extra handholds and railings where possible. The Rosborough has port and starboard sliding doors leading directly to the helm and companion areas plus equipment boxes doubling as steps into the cockpit. 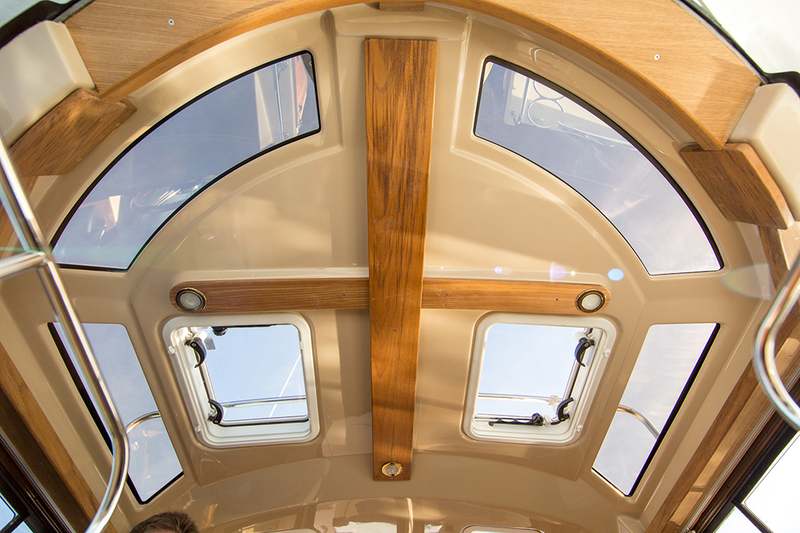 Cutwater and Ranger models all have transom doors leading into the cockpit from the swim platform; optional high hand-rails on the swim platform help make boarding even safer. The Beneteau Swift Trawler 30 had a boarding door about midships in the starboard topsides, for safe and easy boarding from the dock, while the Helmsman had a large boarding door in mid-transom, leading in from the swim platform. Despite their small size, today’s compact cruisers don’t come with small price tags. But for many of their buyers, being able to keep up the cruising lifestyle and even expand their pleasure boating horizons offers the kind of value that is hard to measure. Interiors onboard Cutwater 30 in Miami, FL. This article is featured in the 2017 Spring issue of Boats&Places.